Major transitions rarely happen without stress. Additive manufacturing offers exciting new capabilities, but it also abbreviates the production process that underlies modern mass manufacturing — creating new opportunities as it threatens others. Additive manufacturing equipment can be used on-site, allowing design upgrades to be conducted in a far shorter time frame between initial measurements and final implementation of product designs. Today, a new design can be described in a planning session, prototyped for testing the same day, and then transmitted electronically for production fabrication. This greatly reduces the time it takes to bring a product to market. New product rollouts can be performed globally, using a standard model electronically transmitted to production facilities in close proximity to the intended consumers. No need to design products in one country, have individual components assembled in other countries, and then ship the final assembly to the end consumer somewhere else. Additive manufacturing allows the direct production of increasingly complex end products; eventually it may eliminate the need to produce components in low-wage economies that have fewer safety mandates. This will allow even complex production to be performed locally, which threatens economies that depend upon mass-manufacturing practices currently used in the global market. Current production of goods relies on long production cycles, with items distributed globally using large cargo vessels. The products shipped around the world by these massive cargo ships are transferred to ground distribution through huge ports. Bulk items are shipped by trucks to warehouses in each region and there the products are stored. Ultimately, the items are shipped via truck to the final store. Consider the inefficiency of this system. As more complex products can be fabricated using additive manufacturing, consumers will be able to go online to a local fabricator’s website, order their products with customizations applied, and then pick up their items on the way home from work. There will be no need for mass goods shipment, transportation, storage, and multi-level distribution — with the attendant pollution, fossil-fuel consumption, and cost associated with traditional manufacturing. 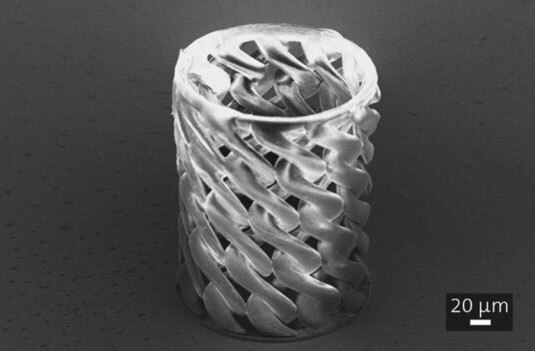 Additive manufacturing allows the use of alternate materials. Thermoplastics and hybrid materials can be combined in granular form for laser sintering. Polymer bindings can enable the fabrication of materials with complex new structures that vary in material qualities throughout its volume. If this process proves economically viable, many industries that currently supply raw material to the traditional fabrication process may have to change to supplying new materials. Additive manufacturing allows the fabrication of objects that include structural voids and other material reductions — while retaining the same strength as their solid equivalents. Like birds’ bones, materials produced by additive manufacturing techniques allow for a solid outer shell filled with a porous inner material that can allow coolant to fill the remaining voids, reducing the total amount of metal needed to fabricate the same engine block or tool head. The porous internal structure will not only require less material to manufacture, but also reduce weight in the final product. Vehicles made using these structures will need less fuel to perform the same task, reducing their operational environmental impact more than simple reductions in fuel requirements. The key to this improvement is the abbreviation of the transportation cycle. Changes in material requirements also allow the use of environmentally friendly materials such as plant-based PLA plastic in place of traditional fossil-fuel-based polymers, provided the trade-off between environmental cost and structural qualities is favorable. The ability to print new parts even for old equipment and outdated designs allows the continued re-use of existing items without need for full fabrication of a replacement object. The ability to fully fabricate copies of existing intellectual property once they have fallen out of patent protection also means that if you truly love your old 1960s Shelby Mustang, there is no reason you cannot keep it running. This will impact existing industries that depend on the resale of outdated capital goods and parts for them, as well as industries that depend on the replacement of existing equipment once the items wear out as planned. Traditional mass-manufacturing is content to produce and sell millions of identical units when the latest product update becomes available: Think iPhone. Personalization of individual items is already being provided through 3D-printed cases and stands to hold these standard designs of (say) this year’s model phone or tablet. As the technology improves, soon the phone itself may be fashioned entirely with 3D printing, or as a wrapper for the basic electronic “guts” of the phone, tweaked to express the unique preferences of each individual owner. Many are taking the potential of 3D printing and applying it to new designs entirely of their own creation. Where the personal printer replaced the scribe, typesetter, press operator, and illuminator, today the home 3D printer allows a single individual to create original holiday decorations, party favors, or even robots without needing a detailed understanding of casting, injection molding, or the other workshop skills traditionally necessary for these tasks. Beyond 3D-printed cake-toppers at a wedding, new designs are being tested that eventually will print out the cake as well. Research into food preservation is moving past canning and pickling and into the realm of science fiction. Powders and pastes can be combined and prepared in a few minutes to provide nutritional and attractive meals created from materials that can be stored years ahead of time. Research in bioprinters is exploring not only how to create new body parts as people age or get injured, but also how to directly fabricate animal muscle tissue in a form suitable for the grill. From 3D-printed steaks that do not require the factory farming of animals to 3D-printed pizzas, all that’s needed is sufficient development of edible materials and suitable printers.